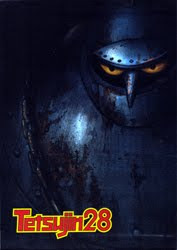 The Anime Archivist: Video Backlog: "Tetsujin 28"
Story Outline: In Tokyo in the mid 1950’s, boy detective Shoutarou Kaneda is hunting down a pair of criminals when a large missile hits the base of the incomplete Tokyo Tower, destroying it. Out of the giant missile comes a one armed giant robot who is headed towards Shikishima Industries. The robot is after his left arm which is in the factory. Professor Shikishima had actually worked with Shoutarou’s father during the war on the Tetsujin project, to create an army of giant robots to win the war. However Shoutarou is able to take control of the giant robot, named Tetsujin 28, via a remote control box in the robot’s left hand. He fights crime and becomes an ally of justice. However the deeds of Shoutarou’s father during the war come back to haunt both him and Tetsujin 28. Mini Review: Geneon snuck this one out in 2005 and it was practically ignored by everyone. That’s a real shame because it’s an excellent series. Unlike the two previous Tetsujin remakes, this one is set in an alternate 1950’s where super technology like advanced robots exist (also taking a decidedly 1950’s retro look in the designs as well). World War II isn’t shied away from either, with more than few characters voicing their unhappiness at the occupation and how the war ended. Despite the source material being over 50 years old, the stories are extremely well written and engaging. The episode that really got me hooked was one were a zookeeper who had to euthanise all of the animals during war befriends a alien blob like creature (similar to the one in “The Blob”). It had all the elements of 1950’s sci-fi, but with a very modern and very poignant twist to the story. If you’ve seen the 1990’s OVA version of “Giant Robo”, you’ll enjoy this series. Not only do we get to see the some of the characters which made appearances in that OVA in their original context in this show, the same director, Yasuhiro Imagawa, has directed this one as well. It certainly takes a somewhat different route than one would expect for such a show. There are couple of negatives with this show, mostly to do with Shoutarou. For example it is never fully explained that he is a boy detective until the third episode. People unfamiliar with the souce material would question what a kid would be doing chasing criminals all day. Shouldn’t he be at school and why the hell is he driving a car? Despite that minor niggling stuff, the show is great fun. I wish fans in the west paid more attention to Mitsuteru Yokoyama’s works. Fantasic, underrated little show. 7.5 out of 10. Remaining Backlog: 19 months (it's much easier this way than listing the number of discs). Video Backlog: "Stratos 4: Return to Base"